Because of our scale we can offer you this service at very competitive rates and provide the reliable, dependable service you require. For expert help in determining what you require, please call our office and one of our Agents will be more than happy to assist. 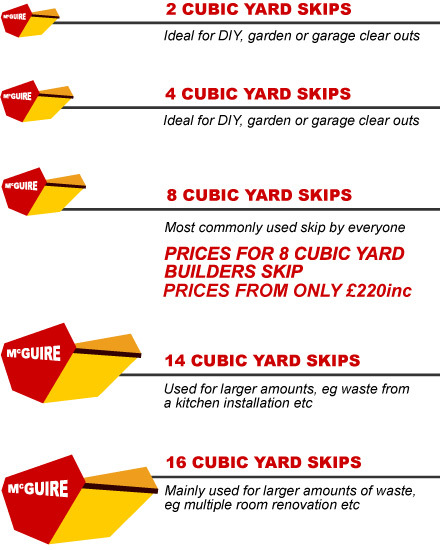 Alternatively, see across the page for the sizes we can provide, along with information on price, suitability, putting skips on the road and other helpful information. Please remember that 100% of the waste we collect is taken to our recycling facility and anything that can be recycled will be!! Once you have decided what size of skip you require you can call our the office on the number below or fill out your requirements on our online enquiry form.